The prime minister of the Hamas government on Saturday called for a cease-fire with Israel aimed at ending Israel's offensive in Gaza, which has killed more than 40 Palestinians, but Israel demanded that Hamas first release an Israeli soldier and halt rocket attacks on its southern towns. Israeli forces rolled toward central Gaza Saturday morning, reports CBS News correspondent Sheila MacVicar — with a threat from senior military commanders that Israel will continue its actions for months, until "the Palestinians count hundreds of dead militants." But the Israeli forces did scale back their operations in other places. Meanwhile, violence claimed the lives of six Palestinians, including a mother and two of her children killed by a blast in their house near Gaza City. Two Hamas gunmen also were killed, and another Palestinian died of wounds sustained in earlier clashes. Israeli troops invaded the Gaza Strip again last week after Hamas militants captured an Israeli soldier in a cross-border raid, and have been battering the coastal strip with heavy artillery barrages and air strikes. On Saturday, Palestinian Prime Minister Ismail Haniyeh urged Israel to halt its offensive, release Palestinian prisoners and resume indirect talks about the captured soldier through international mediators. But it did not offer to free 19-year-old Cpl. Gilad Shalit. "We want to activate this initiative to bring the region out of this whirlpool of blood," Haniyeh said while touring Beit Lahiya, the hardest-hit Palestinian town. Hamas often sends out conflicting signals, however, in part because of divisions between a more militant leadership in Syria and more pragmatic politicians in Gaza. Israel has accused the Hamas political chief, Syrian-based Khaled Mashaal, of ordering the soldier's capture. Aides to Israel Prime Minister Ehud Olmert said he would not accept a truce until Shalit was freed. Foreign Ministry spokesman Mark Regev said rocket attacks must also stop first. The militants have demanded the release of Palestinian prisoners held by Israel in exchange for Shalit. Israel has said it would not negotiate, but some Israeli officials have signaled they are open to an Egyptian proposal whereby the soldier would be freed unconditionally, and Israel would later release some of its 9,000 Palestinian prisoners as a goodwill gesture. About one-fifth of the 165,000 Palestinian government employees will receive a small down payment on long-overdue salaries, officials said Friday. These government employees form the backbone of the Palestinian labor force and their salaries sustain about one-third of the Palestinians. Small down payments have been paid twice before. Iranian President Mahmoud Ahmadinejad warned on Friday that continued Israeli strikes against Palestinians in the Gaza Strip could lead to an "explosion" in the Islamic world that would target Israel and its supporters in the West. He also again questioned Israel's right to exist. "This is a fake regime ... it won't be able to survive. I think the only way (forward) is that those who created it (the West) take it away themselves," he told a rally in Tehran in support of Palestinians. Immigration to Israel is expected to post a three-year high in 2006, boosted by a jump in those moving to the Jewish state from North America, reports CBS News correspondent Robert Berger (audio). Seven planeloads were expected to bring 3,400 immigrants from the United States and Canada — the most in 23 years. With Israel losing the demographic race to the Palestinians, officials say immigration insures the survival of the state of Israel. Intensifying its operations around Gaza City, Israel ordered two air strikes Saturday evening on an outlying neighborhood. The military was investigating whether one of the strikes, which it said was aimed at militants, hit a house, killing a mother and two of her children, including a 6-year-old girl. Four other family members were wounded. The force of the blast tore open one of the house's outer walls. The courtyard outside was stained with blood, and a pool of blood collected near the front door. The lifeless body of 6-year-old Rawan Hajaj was carried inside a Gaza City hospital, wrapped in a red blanket. Her mother, Amona, and 20-year-old brother Mohammed were also killed, and six other people were wounded. A neighbor said he ran to the Hajaj family's house after hearing the blast. "People were sitting under a tree" outside the house when the explosion occurred, said Sakr Hajaj. Body parts were strewn around, and children were screaming when he arrived, he said. Another air strike near a mosque in the same neighborhood wounded four people, including a man identified as a militant. The army cut off electricity Saturday night to nearby Karni, the main cargo crossing between Israel and Gaza. Hundreds of fighters, armed with assault rifles, rocket launchers and land mines, shouted at drivers to turn off their car lights to submerge the area in total darkness. Israeli tanks, meanwhile, moved in a buffer zone inside the crossing, and along the frontier in Israel. Tank gunners in Israel fired at Gaza, as drones and warplanes streaked overhead. Earlier in the day, dozens of tanks and bulldozers had taken up position 500 yards outside of Gaza City. The army said the forces were sent to the area to search for tunnels being dug by militants to attack soldiers. Shalit was captured June 25 by militants who tunneled into southern Israel from Gaza and attacked a military post. Israel launched its invasion three days later. While stepping up its operations in the Gaza City area, Israel pulled its tanks out of the town of Beit Lahiya, leaving a wide swath of destruction after trying to carve out a buffer zone against rockets there. Tanks driving through its narrow streets had shorn off outer walls of buildings, torn down electricity poles and chopped up asphalt. Bullet holes pocked building facades, and bulldozers had torn up fields, knocking down trees and greenhouses. Palestinian farmer Aref Sultan, 45, seized the lull to move his wife and seven children, ages 2 to 16, to a relative's home away from the fighting. Sultan said he and his family had been pinned down in their home during the past day. "We went through 24 hours of terror," he said as the family loaded food and clothing into a pickup truck. "Shots were coming from all directions ... and the tanks were approaching our house. The children, and especially my 2-year-old son Samir, were screaming all the time." Israeli troops also left nearby Beit Hanoun and three Jewish settlements in northern Gaza that Israel abandoned nearly a year ago when it unilaterally withdrew from the territory. 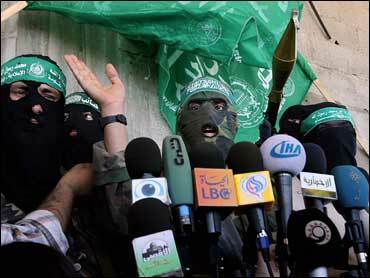 Hamas militants remained defiant in Beit Lahiya after Israeli forces withdrew, inviting TV crews and local residents to a news conference in front of a building. Dressed in black face masks and Hamas headbands and carrying AK-47s, the militants condemned Israel and held up what they said were ID cards Israeli soldiers had left behind. "We warn the Zionist enemy not to invade Gaza again. We have prepared surprises for them if they do," said one unidentified militant. By evening, Israeli soldiers were in position only at the defunct airport in the southern town of Dahaniye and in the Gaza City-Karni area, the military said. Hundreds of Palestinians living near the airport fled their homes for a shelter in a vacant school set up by U.N. officials. Capt. Jacob Dallal, an army spokesman, said troops repositioned Saturday because they had accomplished their objectives in northern Gaza — drawing militants into direct combat. "We much prefer to engage these people with the army as opposed to having these people fire rockets at schools in Askhelon and Sderot," he said, referring to two southern Israeli cities that have come under militant rocket fire. Most of the 44 Palestinians who have died in the offensive have been gunmen. More than 160 Palestinians also have been wounded, hospital officials said. An Israeli soldier also was killed. John Ging, the new head of the U.N. Relief and Works Agency in Gaza, warned that Israel's military campaign has led to a humanitarian crisis. "Water, food, electricity, sanitation; these are the problems. The situation doesn't get more basic than that," he said.